California Yacht Club hosts competition for Fred Harris Libation Cup perpetual trophy, April 7. 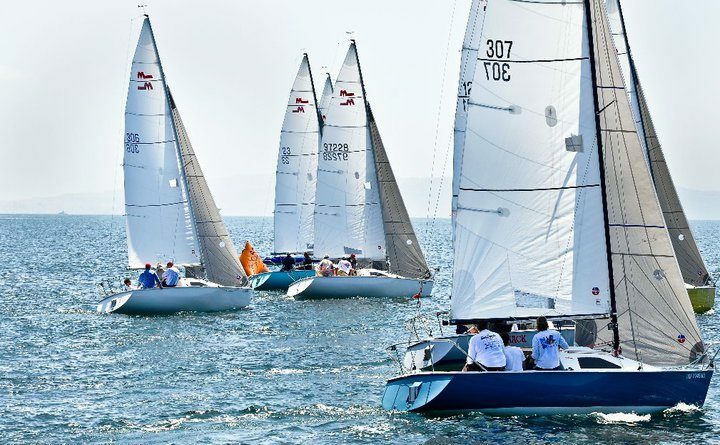 MARINA DEL REY—The Harris Spring Regatta, which is part of the Association of Santa Monica Bay Yacht Clubs’ 2019 High Point Series, will have several one-design keelboats hit the water, April 7. California Yacht Club hosts the Harris Spring Regatta, which is being held at Marina del Rey. Those participating could get a preview of what’s on tap at the upcoming Sunset Series (to be held 10 days later). PHRF winners will have their names inscribed onto the Fred Harris Libation Cup perpetual trophy. Other awards up for grabs are the Commodore’s Trophy for one-design entries and Patterson Bowl for Star Class entries. The regatta is open to all handicap boats with a valid PHRF rating certificate and one-design keelboats. Entry fees must be paid by April 6; the fee is $35 for U.S. Sailing members and $40 for non-members. Classes, class flags and order of starts will be posted at 7 p.m. on April 6; racing begins at 12:30 p.m. on April 7. The trophy presentation will take place after racing. Four races are scheduled. Last year’s winners were John McEntire (Encore, PHRF A), Neil Fraser (Mexican Divorce, PHRF B), Curt Johnson (Avet, PHRF C), Peter Stazicker (Trolleycar, M242), Chuck and Chas Beek (Marianne, Star Class) and Joe Cowan (Cross Fire, PHRF Cruising). Contact Regatta Chair Nicole Harnett – ntharnett@gmail.com – for more information on the regatta.